Understanding how society works would be a huge advantage in our quest to anticipate the future. Understanding how society works is therefore a very worthy goal within our future gazing context. While the fundamental structure and values of society are different for different cultures and through different times in history, human nature has changed very little in the past 3000 years or so. This is obvious from studying literature from past eras (all of recorded history) and also from studying divergent cultures. Creating a vision of the future for the Welder is one of the central aims of our e-zine, The WelderDestiny Compass. It is therefore obvious that we will spend quite a bit of time exploring "how society works", and use these insights to anticipate how these will affect the job of the Welder in the future. This web page is essentially a compendium of articles published in The WelderDestiny Compass that deals with how society works. It assists those that want to follow our discussion regarding "how society works" without having to actually read all the back issues of The WelderDestiny Compass. It will be updated every time we discuss "how society works." 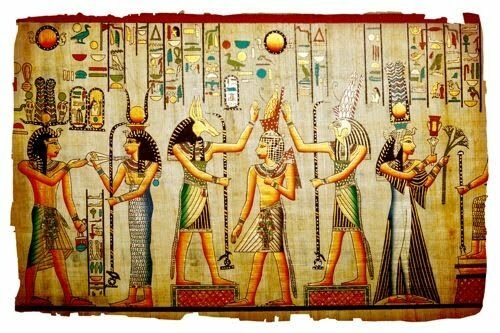 Image of Ancient Egyptian Gods: While ancient Egyptian society was a lot different to ours today, human nature was pretty much the same. Very little has changed in human nature in more than 2000 years. As you read the compendium of the articles within this page, please keep in mind that these articles also have reference to other articles within the same e-zine edition in which they were originally published. This may make the different articles below appear a little disjointed. If you would like to see the broader context of any specific article, please click through to the full e-zine to get a more complete picture. When we see jobs being lost to automation, our emotions respond in a manner that tries to protect our own self-interest. We believe that there needs to be some protection for our jobs from this onslaught. While this emotional response is natural, history suggests that it is not very useful in the long run. As an example, I look at the automotive industry in Australia. When the Australian automobile assembly plants were not competitive with those from Asia, the government subsidised the companies running the plants. The alternative was to automate the plants so that the high wage rates in Australia could be neutralised, but the job losses were politically unpopular, hence the subsidy option being chosen. For years, this subsidy system prevailed in Australia, while car manufacturers in other developed nations such as Japan, South Korea and Germany (who also have relatively high wage rates) followed the automation route. Eventually it became clear that the subsidies in Australia were not sustainable, and the government had no choice but to eliminate them. The nett result is that the automobile assembly plants are closing, with the associated loss of not only the jobs in the assembly plants, but also in the numerous small businesses that provided components and services to those assembly plants. In hindsight, we see that it would have been better to encourage the automation. While this would have resulted in job losses in the short term, it would have saved a lot of jobs in the associated small businesses. In addition, it could have resulted in a burgeoning industry in the automation and robotics technology sectors that could service the equipment for the automotive industry. Instead, those industries were developed in Japan, South Korea and Germany. If you believe that your job is being threatened by automation or robotics, then it is time to decide how you can add value to what you provide. As a rule, it is best not to compete with technology, but rather to use technology to become more competitive. Ask yourself how you can get an edge and significantly increase your productivity using technology. High productivity and value add is the best protection against job losses. Your productivity needs to be high enough that the cost of capital associated with automation is just not worth the investment. This additional value can be achieved in several different ways, including your skill, knowledge, experience and ability to flexibly interface with a team. To give up what you know is only possible when you acquire alternative tools. Always keep your eyes and mind open to identify your opportunities for acquiring those alternative tools. Remember, for salvation we need to move beyond fear. When automation comes knocking on your door, don’t be the man doing a machine's job! Whenever the effects of automation are discussed, invariably we will hear that the machines and robots will eventually take over all our jobs. Eventually we will have no more work! This argument assumes that the only “work” we do is what we do as an official “job”. In the new era coming, there will indeed be very few jobs as we define them today. Instead, our work will be to find the niche within which we can attract wealth towards ourselves. The way to attract wealth towards ourselves is to find a product or service that adds enough value to somebody else, that they will be willing to pay for that product or service. This is just entrepreneurship 101. The most successful people will not necessarily be those that “work the hardest”, but those that find the best way to add value to others at the lowest cost and effort to themselves. In other words, you need to become good at identifying a niche, and being able to supply into that niche. Ask yourself: What skills do I need in the coming era to identify niches, and then supplying into those niches? If you are asking the question: What job can I do? Then I believe that you are asking the wrong question for the machine age. Work does not equal job. Work equals adding value to a niche. We will discuss this mindset, and the consequences, in future editions of The WelderDestiny Compass. While the consequences of much of the new technology being developed today will be automation of jobs, this technology is also going to make our work environment really cool! In The Hitchhiker's Guide to the Galaxy, a book by Douglas Adams, the ultimate question was posed to an enormous supercomputer named Deep Thought. The question was: "What is the answer to life, the universe and everything". Deep Thought computed away for 7.5 million years and came up with the answer: 42. So, there you have it folks, the answer to the ultimate question is 42! The problem is that nobody really understood the question. In the book, they needed to wait another 7.5 million years for the computer to tell them what the REAL question is. I use the amusing anecdote (well I find it amusing!) from The Hitchhiker's Guide to the Galaxy, because it is really a parody of what jobs in the machine age will be about. We already have "deep thought", and deep thought will only get more powerful in the future. Just about any answer we are looking for can be found by asking deep thought. Now, in our world "deep thought" is not a single computer, but it is the ability to find just about any answer you want by asking it to platforms like Google. Google already has all the answers! Well, maybe not all the answers, but it certainly knows a hell of a lot more than you or I or any other single individual, because it is the embodiment of knowledge aggregation. In my early years as an engineer, before the internet, when we wanted to find answers to questions we needed to look for it in books, or journal articles, or from a really clued up person, or develop it ourselves by doing expensive research and experimentation. Now we ask Google! In the good old days, the really good engineers were the guys that had all the answers in their head. You could just go to them, and they would give you a pretty good answer, without having to do the research. The really good engineers were the smart people. Now you can get the answers from Google within the time it would take to walk over to the smart engineer's desk! Not only will you get a single answer to your question, but there will be a number of different answers that may be better suited to your specific situation. We all know that knowledge is power, but in the machine age we all have access to the knowledge. Not only do we have access to the knowledge, but the machines also have access to the knowledge. Remember that when we are asking Google, we are getting the answers from a machine. Once the machines get smart enough to be able to access the information themselves, then people who only have an edge due to their "knowledge" will have no edge at all. If your job is only about knowledge, then you are in a job that will be done better by a machine in the not so distant future. Artificial intelligence (AI) will replace you in your job. This sounds rather depressing, because not only will machines take over physically repetitive work (e.g. production lines) but they will also take over knowledge based jobs. So, what will the future human job look like? In the machine age, human jobs are those that require skills that machines are not so good at, or that machines cannot perform economically. One of the primary skills that you will need in a human job of the future is problem solving. In other words, the primary skill is knowing what the right questions are. Once we can figure out what the right questions are, then we can rely on the machines to give us the answers. That is what they are good at. That is why a human teamed up with an AI will be the way of the future. As kids in school we had to learn the facts that the teacher was trying to get into our heads. The kids that were seen as the smart one's were able to provide the right answers to the teacher's questions. To get "the brownie points", you had to be able to supply someone else's answer to a "canned" question. Notice how this does not seem like a good idea given our discussion of what skills you will need in the machine age. Things were a little better when I went to university, but not much! If you liked a course, you would apply yourself, but often you just did the course to get the necessary credits. It was a means to an end, rather than being the end in itself. The usual way to pass exams for these less favoured courses was therefore to do as little as possible during the term, and then cram for the exams. While this allowed me to pass the exams, I can't claim to actually remember too much about those courses. Luckily for me, it has become much less important to remember the facts, because I can just Google them! If we think about it, we see that kids from the earliest age are on a constant learning curve. So, how do kids learn before we send them off to joint the school and college system? I ask, because this is a time in their lives when they seem to learn the most, without much effort from those around them. There is no curriculum, trained teachers or exams. They just seem to pick it up all by themselves, with only minor inputs from those pesky adults. The answer is that they learn in a self-directed fashion because they have some need for enquiry that was stimulated. They do this while having fun in the process. Their learning is self-directed, because they learn those things that are needed to solve a problem in their lives. If you are lying around on the floor and you want to get to that very interesting looking Ming vase that your mother has precariously perched on a coffee table, then you need to learn to crawl. Once you can crawl, but you are still too low to reach that interesting Ming vase, then you need to learn to stand. When your mother takes that very interesting Ming vase away, you understand that you could probably get to things a lot faster if you walked like she does. Then you can probably get to the Ming vase before your mother has time to remove it. Something else that is obvious in this "real world" learning situation, is that you need to learn one thing before you move to the next level. You cannot run before you can walk. You cannot write poetry before you can read. One skill is dependent on another. Self-directed learning of things that you find interesting, and having fun doing this, seems like a dream situation. Unfortunately it also seems like a pipedream, because it is not possible for each school kid and each college student to have their own teacher to customise their courses and constantly look over their shoulder while they are learning. This is certainly the case at the moment, but what happens when artificial intelligence (AI) enters education? Once AI enters education, true outcomes based education, true self-directed learning and individually customised "courses" become possible. Not only will the AI guide you through the problem solving process, and provide the basis for your self-directed learning efforts, it will also make sure that you have mastered all the skills necessary before moving to the next level. Not only will the education process be self-directed, but the pace of education as well, because we do not all learn at the same pace. AI will make sure that no child is left behind! Well, actually AI will make sure that no adult is left behind either, when we are talking adult education. Adult education will become a much bigger industry than that for kids. The AI supported education paradigm will ensure that the emphasis is on learning skills, rather than learning facts. Obviously skills are underpinned by facts, therefore the learning of facts will never end, but once you have the necessary facts to apply the skills required, then further learning (and remembering) of facts is not that necessary. If you get a kick out of learning facts, then nothing will stand in your way, but once you have enough facts to allow you to know what the right questions are, then the rest of the facts can be provided by the machines "on-the-fly". Due to the rapid advancement of technology and knowledge, what you know today may not be valid by next year this time. Such knowledge should therefore be seen as transient in any case. Constant learning is therefore also "baked into the equation" of the machine age. Mister Goldratt was a really good and respected management guru. I believe the principle stated in the quote above is entirely correct, but with respect, I also believe that it misses the critical issue. The critical issue is that if people know how you measure them, then the measure becomes subjected to manipulation and therefore largely ineffective. This is especially so if there are "consequences" attached to the measure. Businesses the world over link managers' and workers' pay to achieving certain "goals". Typical are the share price of the company, efficiency measures of departments, customer complaint levels and injury rates. The nett results are that executives manipulate the share prices through inefficient share buy-backs, managers manipulate inter-departmental efficiencies to optimise their own numbers at the expense of the company as a whole, and workers do not accurately report safety incidents or customer satisfaction. In the case of politicians, the typical measures are inflation, joblessness and economic strength through measures like Gross Domestic Product. (GDP) Over time, these "statistics" have been tortured by government departments to within inches of their lives. These days, the meaning of those numbers are about as reliable as the information supplied by somebody being encouraged by a bit of waterboarding! The same effect is at work in models that predict share price movements. Many economic gurus have proposed really great methods for predicting share price movements. Initially these measures are great, and have good predictive properties. However, once enough people know about them, and trade accordingly, the new trading patterns start to affect the share prices. This results in volatility and movements that effectively neutralises the predictive value of the proposed model. In short, if you want a good measure of anything where humans could influence the outcome, don't tell them how you are measuring them!